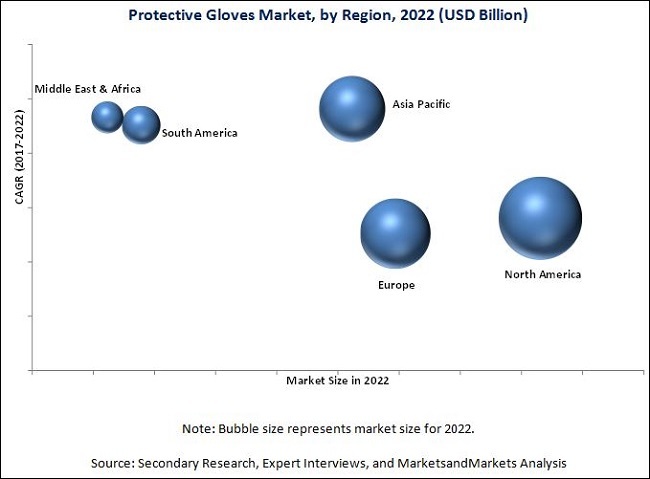 [161 Pages Report] on Protective Gloves Market is estimated to be USD 8.69 Billion in 2017 and is projected to reach USD 11.26 Billion by 2022, at a CAGR of 6.4% from 2017 to 2022. In this report, 2016 is considered as the base year and the forecast period is from 2017 to 2022. Asia Pacific is the fastest-growing market for protective gloves due to the high production and usage of protective gloves in the healthcare, manufacturing, food & beverage, oil & gas, construction, and transportation industries. Stringent health & safety standards in these end-use industries drive the growth of the protective gloves market. Key manufacturers of protective gloves include Ansell Limited (US), Top Glove Corporation Bhd (Malaysia), Honeywell International Inc. (US), Supermax Corporation Berhad (Malaysia), 3M Company (US), Hartalega Holdings Berhad (Malaysia), W.W. Grainger, Inc. (US), Kimberly-Clark Corporation (US), and Protective Industrial Products, Inc. (US). This report categorizes the global protective gloves market on the basis of material, type, application, end-use industry, and region. The global protective gloves market is estimated to be USD 8.69 Billion in 2017 and is projected to reach USD 11.26 Billion by 2022, at a CAGR of 6.4% during the forecast period. 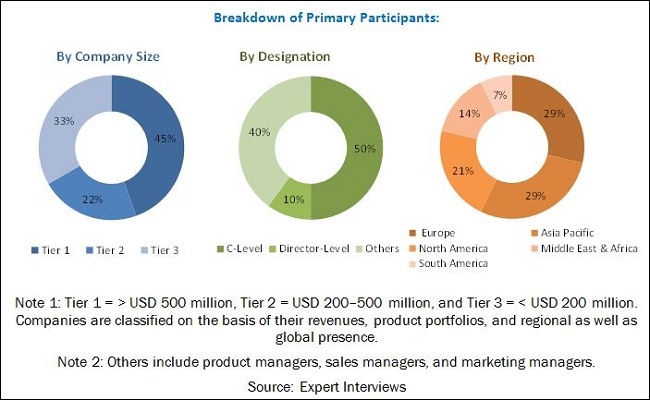 The increasing demand for disposable healthcare gloves and strict regulations pertaining to safety and protection drive the growth of the global protective gloves market. On the basis of material, the global protective gloves market has been segmented into latex, nitrile, neoprene, leather, vinyl, and others. The latex segment is expected to lead the market during the forecast period, followed by the nitrile segment. The latex segment is also projected to grow at the highest CAGR between 2017 and 2022, owing to the increasing usage of latex gloves in healthcare, food & beverage, oil & gas, and other industries. Based on type, the global protective gloves market has been segmented into re-usable and disposable. The disposable segment is projected to grow at a higher CAGR as disposable gloves are considered to be more comfortable, softer, and cheaper than re-usable protective gloves. Based on application, the global protective gloves market has been segmented into chemical, mechanical, biological, thermal, and others. The chemical segment is the largest application segment of the market. The chemical protective gloves provide protection against alkali, organic & inorganic acids, hydrocarbons, and other harmful chemicals. Based on end-use industry, the global protective gloves market has been segmented into healthcare, food & beverage, manufacturing, oil & gas, construction, transportation, and others. The healthcare industry has a huge demand for disposable gloves. The rising medical standards are also expected to further drive the demand for protective gloves in the healthcare industry during the forecast period. On the basis of region, the global protective gloves market has been classified into Asia Pacific, Europe, North America, Middle East & Africa, and South America. The North Americas region is the largest market for protective gloves. The North America protective gloves market is largely driven by the increased awareness about safety as well as regulations that mandate the use of protective gloves in various industries. Major factors restraining the growth of the global protective gloves market include the high concern for skin allergies and increasing automation, which reduces manpower, in several industries. Some of the key players operating in the global protective gloves market are Ansell Limited (US), Top Glove Corporation Berhad (Malaysia), Honeywell International Inc. (US), Supermax Corporation Berhad (Malaysia), 3M Company (US), Hartalega Holdings Berhad (Malaysia), W.W. Grainger, Inc. (US), Kimberly-Clark Corporation (US), and Protective Industrial Products, Inc. (US), among others. 12.10 Protective Industrial Products, Inc. Figure 23 Brazil Dominates Construction Industry in South America, 2016 vs 2021.